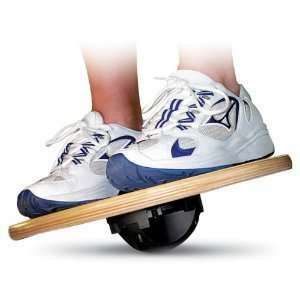 The Wobble Board is a training equipment for improving balance, coordination, core strength and stability. It is simply a wooden disk with non-slip surface on top (where you stand) and a plastic hemisphere on the bottom (where it touches the ground). This system enables a wide variety of exercises – from simple moving from side to side without touching the ground with the other sides to push-ups, sit-ups or standing on one leg. Great news is that Wobble Boards can be used by anyone – adults, children, seniors, no matter if you are a beginner or professional athlete. Everyone can enjoy it. 16" – The disc is smaller which means larger wobbling angle. I would recommend you this one because it`s cheaper and provide a better training challenge. 20" – Larger board means smaller woblling angle and easier training. 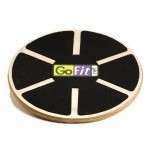 If you are looking for some cheaper alternative, I have a solution for you – the GoFit Ultimate Wobble Board for $49.99. The quality of material is worse compared to the previous stuff but still on a solid level and I can recommend it. The height of the base is adjustable so you can set the difficulty of workout as you like. Also includes "Core Performance" DVD to help you select the right workouts.